Take a Tour With Me Tomorrow! . . . In case you haven’t yet noticed. . . we’ve got a brand new website here at CPYU! A big thanks goes out to Chris Wagner and his team of subcontractors for pulling this off. Chris, you have some great work here. Tomorrow at 2pm, eastern time, Chris is going to walk me through a little tour of the brand new cpyu.org. I’m thinking that some of you might like to tag along. Chris will be showing me what’s there and how it works, along with talking a little about what’s in store for the future. 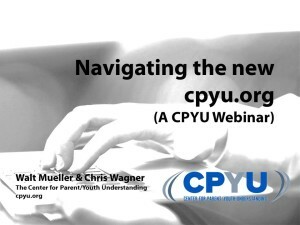 If you want to join our little walk through the new cpyu.org, just click here to register for a free 30-minute webinar. Chris will lead us all on a tour of the new website. We’ll be talking not only about what’s there already and how it all works, but we’ll share with you some ideas on how to use what’s on the website in your youth ministry and home! You can register for the free webinar here! ← Pay Attention! . . .